This cabinet card photograph is of the 1896 Independence, Kansas, baseball team. Independence joined the Kansas State League when it was established in late June 1896. Other members of the league included Parsons, Emporia and Junction City. By mid-July, however, the league had expanded and reorganized into northern and southern divisions. The Northern Kansas League included Junction City, Topeka, Emporia and Minneapolis. Members of the Southern Kansas League were Independence, Parsons, Chanute and Coffeyville. Independence finished first in the Southern Kansas League. 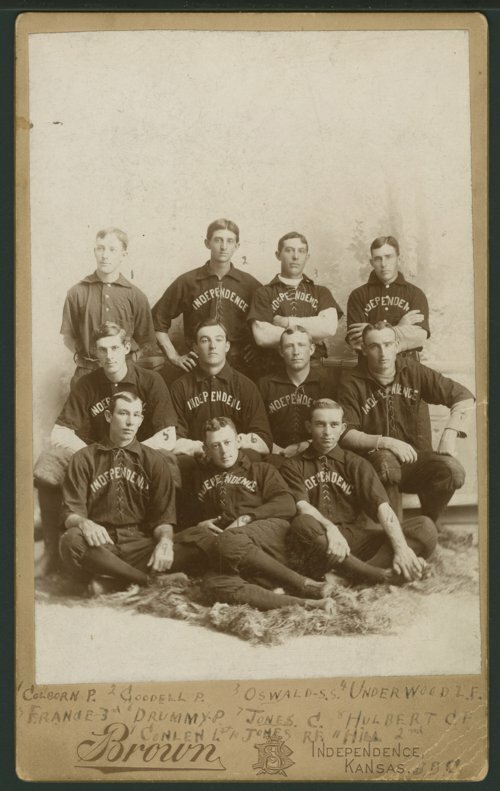 This photograph was taken fairly late in the 1896 season since it includes two players who joined the team in mid-August. The players pictured include: top row (l to r) -- Harry Colburn (p), Doc Goodell (p), Billy Oswald (ss), Jimmy Underwood (lf); middle row (l to r) -- Walter Frantz (3b); Tom Drummy (p), Claude Jones (c), Hulbert (cf); bottom row (l to r) -- William Conlin (1b), E. Jones (rf), and Wiley Hill (2b). The photographer was Brown of Independence.